There’s no party without chicken wings and my favorite happens to be the wings gotten from the stewing hen. I shared only one recipe this summer and I wanted something with a little excitement; especially for my children who happen to love chicken wings; and trust me I never thought my ajebutters would like these chicken wings until of course I made some and the whole gallon sized zip lock filled with chicken was gone. Having a party, planning a girls night out or throwing a surprise birthday bash for your friends? This wing recipe has got you covered. One bite and you’ll fall in love. 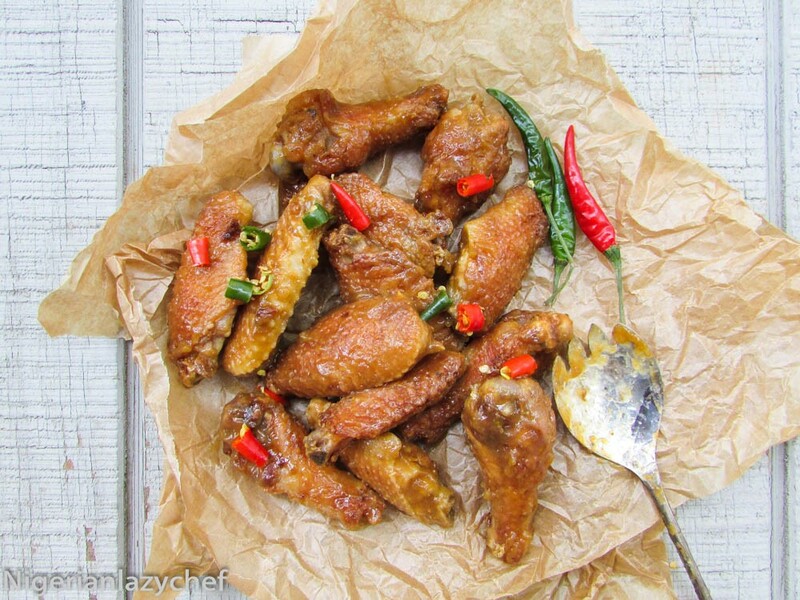 Speaking of having a blast, my ajebutters had a whole day’s blast with this wing recipe. I made it two ways. I had one fried and I had another tossed in the mango chili sauce before tossing in the oven. Thanks to my two ladies Ify and Matse for their wonderful ideas. This recipe is very easy and can be made at anytime of the year. My love for mango was the inspiration. I had to do a mango sauce of some kind before the mango season was over and kaboom; Adashofmegnut saved the day. I have not really shared a lot of recipes this Summer, so my end of Summer recipe had to be lit! Another way to enjoy this chicken without the quick fry method is to toss the cooked chicken with the sauce and cook in the oven until slightly brown. It is absolutely delicious :)…. If using using the soft chicken simply season with salt, paprika, pepper and bake in an oven; then toss in sauce and broil. This entry was posted in Appetisers, baking, Barbecue Chicken Recipes, Barbecue Recipes, chicken, chicken dishes, Chicken Recipes, Eating Healthy, Uncategorized and tagged eat your heart out, habanero and mango chicken, habanero and mango chicken recipe, how to plan a party for your girlfriend, Nigerian food blog, spicy chicken wins. Yum!I am going to try it. Definitely going to try the mango sauce. I’ve only tried mango in curry so this will be a learning curve. I’ll post it on my blog and link you when I do (if you don’t mind). Give me this and a coconut pineapple cocktail and I’m good to go.